Medical List - This is a dated list of each medical appointment I have and the purpose of the appointment, or anything significant related to Medical (such as when I started taking a new medication) This serves two purposes, first, it helps me at tax time to calculate my medical mileage and to make sure I have the necessary receipts. Second, it is very helpful when talking to medical staff to quickly be able to give them information they need, such as last flu shot, or when I was diagnosed with something or started taking a medication. This list gets archived into my medical binder at the end of each year. I am also going to start capturing this information in Evernote so I can have access to previous years information on the go. 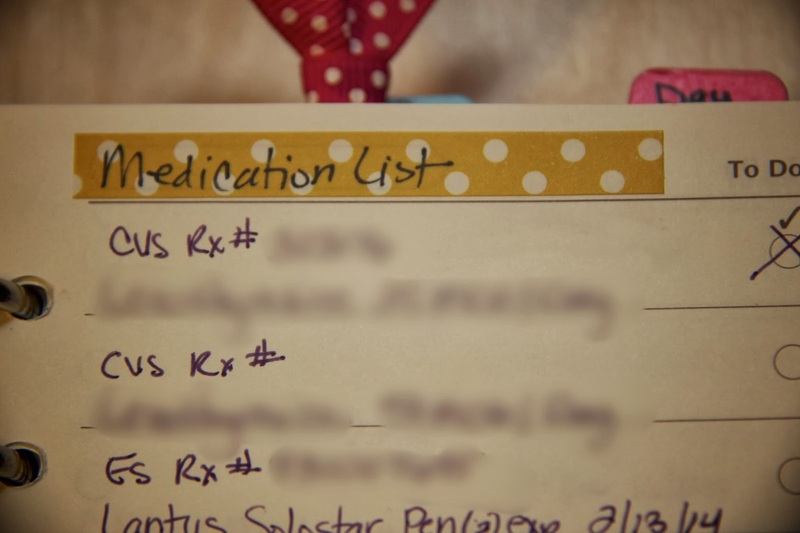 Medication List - I use a Filofax Cotton Cream To Do list Sheet, since it has double spacing. For each medication I track the pharmacy, prescription number, medication name, dose, and when the prescription expires. Sometimes I also include how many refills I have left. I only list out medications that I take on a regular basis. 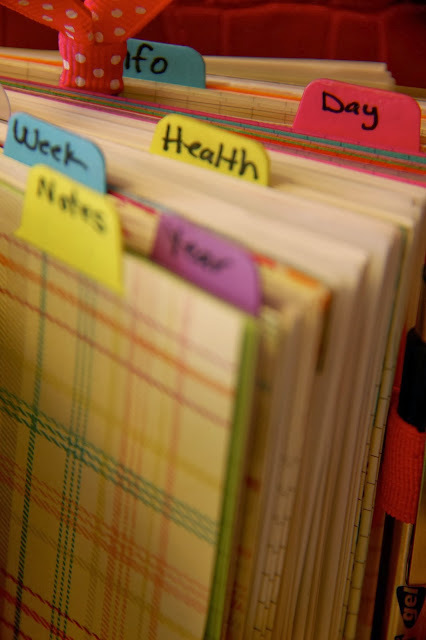 Vitamins List - I use a Filofax Cotton Cream To Do list sheet for this as well. I list the name and dose of any over-the-counter vitamins I take on a regular basis. Medical Notes - I use Filofax white ruled note paper because it is thin (so I can keep a lot of it in my binder) and cheaper than cotton cream or colored paper. This is just a running notebook of medical information. If go to a doctor visit, I keep notes at the appointment, or I enter notes as soon after as I can. I put the title (usually the doctor/company name), date, day of the week. I also track any medically related phone calls and who I spoke to. The notes mainly consist of what we talked about, any changes to my care, any procedures they did, and any specific medical condition or diagnosis information they give me. Since it is a running notebook, my current page is marked with a custom fly-leaf I made with slotted holes so I can move it when needed without opening the rings. It has a side tab so I can quickly get to the right page. I also have a Leuchtturm pen loop attached to the fly leaf. These pages get archived to my medical binder. 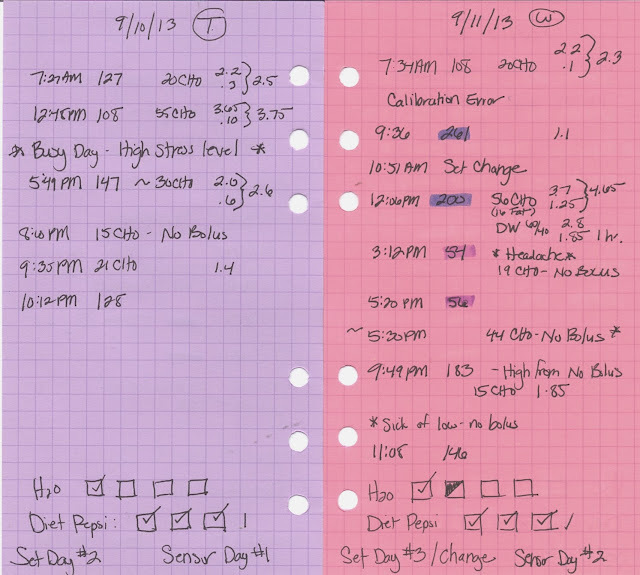 Diabetes , Fitness, and General Health Tracking (My Logbook) - I use bright quadrille paper from KiddyQualia. The paper is so bright and fun, and is thick enough to handle darker ink gel pens. I have one page per day and track blood sugar readings, if the reading is 'off' then I highlight it and try to figure out why and write notes about that. I include how I am feeling (stressed? Headache? ), nutrition information that may affect my diabetes, If I changed settings on my insulin pump (like suspending or temporary basal rate). 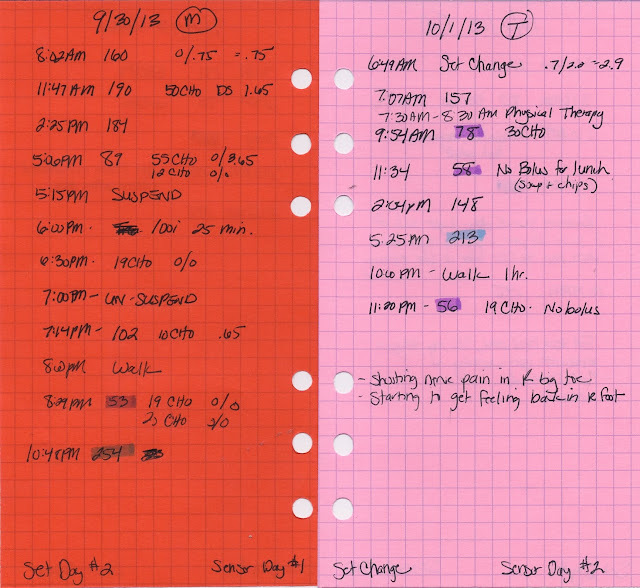 This page is also where I track exercise (since it has a large impact on my blood sugars), water and Diet Pepsi intake (I'm trying to quit this habit), and what day of the Infusion Set and Glucose Sensor I am on. These pages get archived to my medical binder. 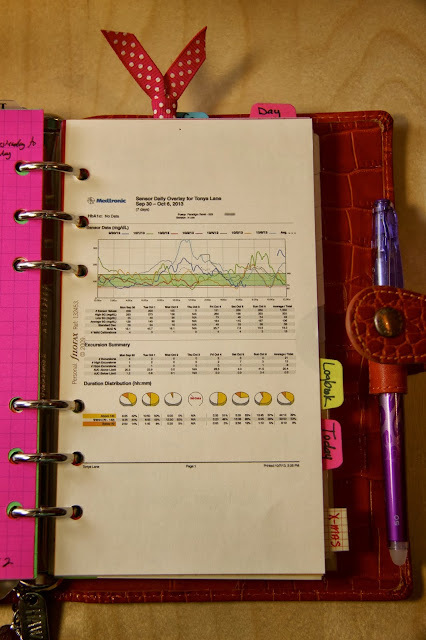 I have been tracking weight and my measurements and detailed nutrition information in a bound notebook, but I may end up moving them to this section as well. Another idea is to record workout sessions, specific sets and reps, weights, etc. Reports - This is specifically related to diabetes. I upload all of my blood sugar and sensor readings online so that my doctors can access it. I run reports, and then I shrink them to fit into Filofax Personal paper. I print them out weekly (on Filofax Cotton Cream Paper) and then analyze the reports and write notes. This helps me to spot patterns for when blood sugar readings are off. I write notes on the back of the report and come up with ideas of what I want to focus on for the next week. The reports are tiny but I can still read everything. This is one of the main reasons I'm considering moving up to A5. I am very pleased with how this section has kept me focused on my health, and has come in handy for taking with me to doctor appointments! I track days I have to do a set change or sensor change. Since this isn't on set days of the week, it is hard to keep track. So I use a Martha Stewart Dew Drop to indicate the next time I need to do a set change, and another one for sensor changes. Once I have done the change, I put a little MarkIt Dot next to the date (Orange = Set Change, Green = Sensor Change), and move the dew drop. I highlight any medical related appointments in pink and put Pd. next to them if I have paid my copay. Whew, that was a long post. Thanks for reading! I'm glad you got something useful out of the post. Thanks for reading and commenting!